Tokoniji Falls (常虹の滝) are waterfalls located in southern Toyama. There are 5 different waterfalls. Tokoniji Falls is their generically name. 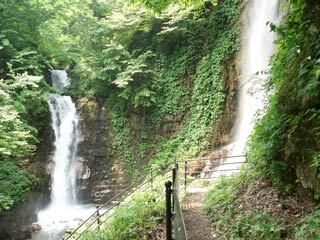 It is designated as waterfalls of Toyama. Tokoniji literary means "There is always rainbow." In the morning, you can often see rainbow.